SolarWinds® Web Help Desk® is a web-based automated ticketing solution that helps you manage your IT support requests for both internal and external clients. Use Web Help Desk to create and manage tickets in your help desk operations. Check out this video (1:23) for information about training and documentation resources available to help you implement Web Help Desk. For a stand-alone installation of Network Performance Monitor, install the product on a dedicated server with your choice of an embedded PostgreSQL database or an external database such as MySQL™ or Microsoft® SQL Server®. After configuration, you can use Web Help Desk as your ticketing system. 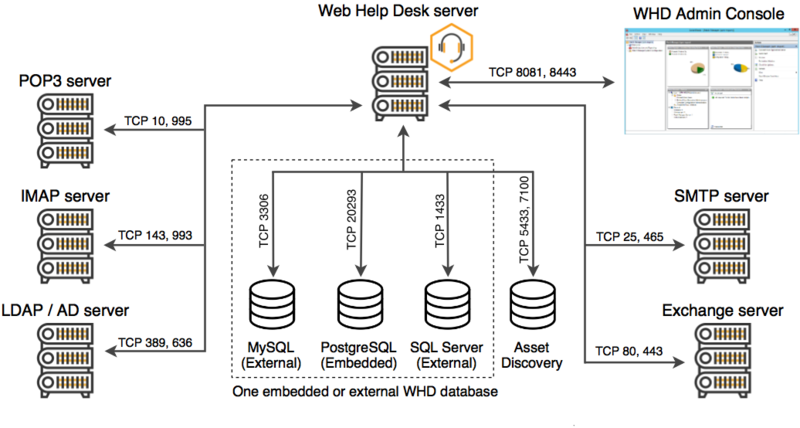 By default, the Web Help Desk Admin Console uses secure port 8443 to connect to the Web Help Desk server. You can integrate a stand-alone installation at any time to an Orion Platform environment. 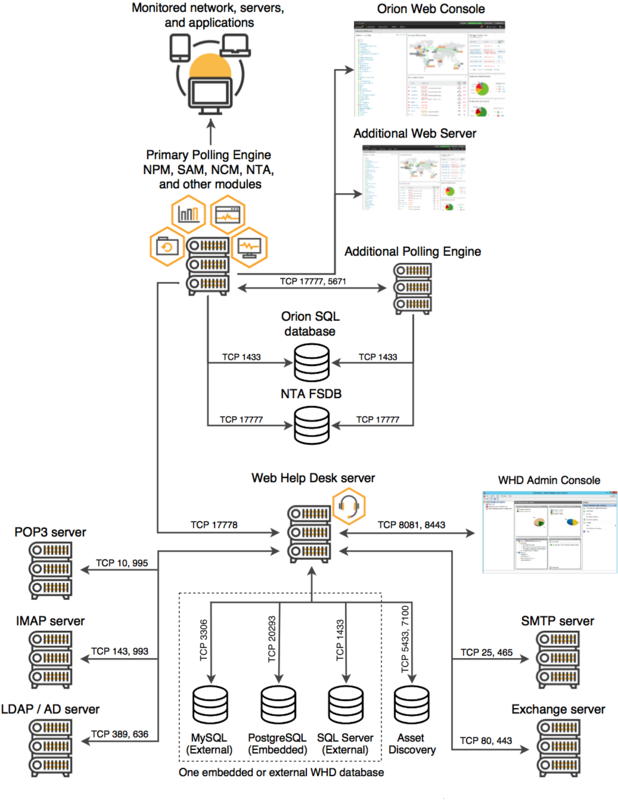 Web Help Desk supports an integrated installation into an existing Orion Platform. For this configuration, install the product on a dedicated server, select and implement an embedded or external database, and create a SolarWinds integrated connection in the Web Help Desk Admin Console to the Orion Platform. When you are finished, create or modify alerts in the Orion Platform to integrate with other SolarWinds Products and subscribers. This configuration links Web Help Desk to SolarWinds Network Performance Monitor (NPM), Server and Application Monitor (SAM), and Network Configuration Manager (NCM) systems to automatically create new tickets from Orion platform alerts and dispatch the appropriate techs to address the issue. This installation assumes that the Orion Platform and monitored products meet the SolarWinds product integration requirements. If your environment uses SolarWinds High Availability, see the High Availability requirements in the SolarWinds NCM Administrator Guide or the SolarWinds NPM Administrator Guide as part of the installation. Web Help Desk includes a 14-day evaluation license. During the evaluation period, you can create an unrestricted number of techs and access all product features. After the evaluation period, all tech accounts are deactivated. To continue using the product, you must purchase a full product license from SolarWinds Sales. The following terms provide context for SolarWinds product architecture, roles, and components. Admins: techs with privileges to configure Web Help Desk, set up tech accounts, and define tech groups. Clients: end users or customers who can open tickets in Web Help Desk. Clients can enter tickets through email or through the Web Help Desk Admin Console. Request Types: A classification that identifies the type of support request. Request types are used to automatically assign tickets to the appropriate tech group. Techs: Web Help Desk technicians who troubleshoot, resolve, and manage customer tickets. Techs can be members of a tech group who address specific request types. Techs can also create tickets. For example, when a client calls the IT Help Desk, the tech opens a ticket on the client's behalf. Additionally, techs can open tickets that are not associated with a client, such as tickets to schedule routine maintenance or system upgrades. Tech Groups: a group of techs with similar skills and expertise who address specific ticket request types, such as IT or Facilities. A tech group can include multiple levels so complex or difficult tickets can be escalated to more experienced techs. Tickets: support requests opened through and managed within Web Help Desk. Tickets can be initiated through email, created in the Web Help Desk Admin Console, or imported from another application.